Our younger daughter is in her early 30's, a perfect age to live and work in Toronto, one of the largest cities in North America. Her apartment is small but her social life occurs in the cafe's and bars where her friends congregate. It's a good life, but it's become unsettling recently because of a number of shootings in public places. 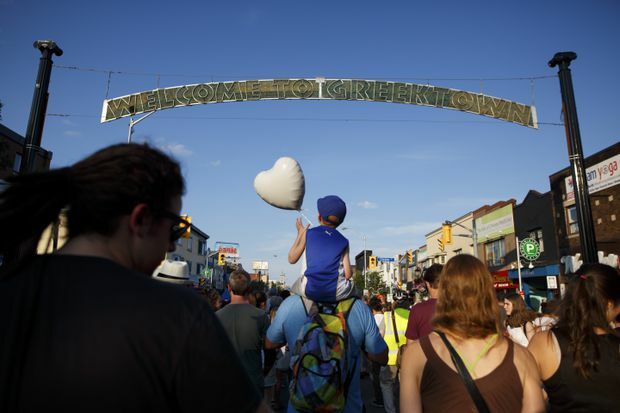 It has certainly come home for us in light of the rampage in Greek Town, on the Danforth, earlier this week. This is a bustling strip in the summer with lots of outdoor patios. A mentally ill gunman opened fire, killing a young girl and a teen, injuring many more. We're not accustomed to this in Canada and neighbourhoods such as the Danforth have always been considered safe. You may have noticed, as I have, that there have been a couple of memorial gatherings, one of which took place in a church and the other which began at one. We know that there were prayers and opportunities for somber reflection. Mayor John Tory was interviewed outside one of the churches and I noticed that those departing the building included a number of Muslims, so it was interfaith even though it was a Christian sanctuary. It may have been Eastminster United and last night's candlelight vigil stopped there. I've noticed that when these inexplicable events occur (think of the van attack in April) people need to gather and attempt to make sense of random violence. Invariably clerics of different traditions are included and while Toronto is a secular city for the most part, there is room for the sacred in these moments. Often a hymn such as the overworked Amazing Grace is sung or, as in the case of last night's vigil, Leonard Cohen's quasi-sacred Hallelujah. I think its important to note that in a time when churches are closing with alarming rapidity and even entire denominations such as the United Church are pondering their futures, there is still room for the sacred and --dare I say it -- God. Many of the people who attend these events are younger even though this demographic tends not to be involved in organized religion. While we may be keenly aware of this "when bad things happen to good people" God is always present and patient in the rough and tumble, sorrow and excitement of city life. I'm glad that last night the powerful and fitting John Bell chorus Don't be Afraid was part of the vigil.